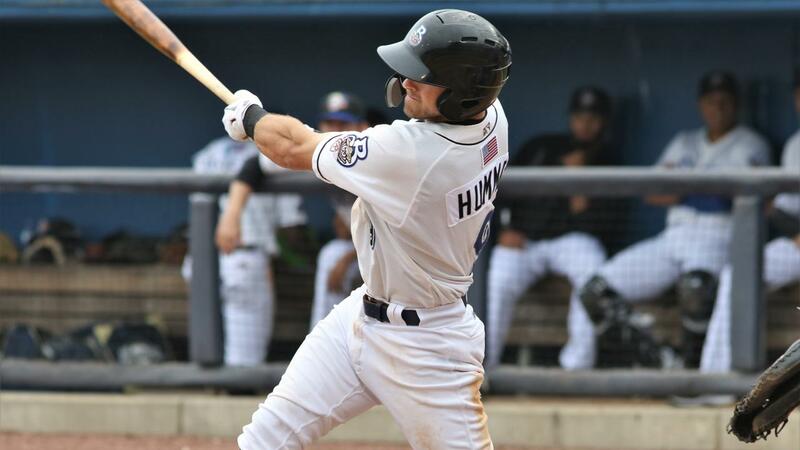 Cooper Hummel delivered a go-ahead homer for the Biloxi Shuckers (5-4) as part of a 5-3 win over the Montgomery Biscuits (4-4) on Saturday at Riverwalk Stadium. Batting with one out in the eighth against RHP Jose Disla (L, 0-2), Patrick Leonard drew a walk, bringing Hummel to the plate. Batting from the left side, the switch hitter cranked a no doubter over the right field wall, his second home run of the season, to put Biloxi in front for good. RHP Aaron Kurcz (W, 1-0) came out for his second inning of work in the bottom of the eighth and surrendered a one-out walk to Kevin Padlo. The Biscuits ran into an out, though, when Padlo attempted to steal second on a pop out to right by Jermaine Palacios. Hummel secured the catch in shallow right field and fired a strike to Leonard at first base, doubling up Padlo to end the frame. RHP Nate Greip (S, 3) allowed a pair of base runners in the bottom of the ninth on a single and a walk but struck out Jesus Sanchez for the last out of the game. The save is Griep's league-leading third of the season and 37th all-time with the Shuckers. Biloxi got on the board in the second without recording a hit. Facing opener LHP Dalton Moats, four consecutive Shuckers batters drew walks, forcing in a run to put Biloxi up 1-0. Michael O'Neill reached on an RBI fielders' choice, pushing home another run to make it 2-0. Though he didn't factor into the decision, RHP Thomas Jankins pitched an effective game. The righty allowed his first run in the fourth after a fielding error and an RBI single by Brendan McKay. Despite another fielding error in the frame, Jankins limited the Biscuits to a singular run in the fourth. The Shuckers added on a run in the top of the sixth thanks to the heart of the lineup. Weston Wilson smashed a one-out double into the left field corner and scored on a single to right by Leonard. Biloxi loaded the bases but was unable to put across another run. Jankins came out to pitch the sixth but walked Sanchez and gave up a single to McKay. RHP Nattino Diplan came in to relieve Jankins and allowed a two-RBI double to Rene Pinto that knotted the game at 3-3. Diplan stranded the bases loaded, inducing a groundout from Josh Lowe to end the frame. Biloxi can win their series against the Biscuits in a rubber match on Sunday afternoon. The Shuckers are scheduled to send RHP Alec Bettinger (0-0, 5.40) to the mound against Montgomery RHP Ricardo Pinto (0-1, 14.73). The game can be heard locally on Cruisin' WGCM AM 1240/100.9 FM, TuneIn Radio or the MiLB First Pitch App.